Other chapters focus on Infantino’s early career in the Golden Age of comic books, his work on such Silver Age icons as Adam Strange, Batman, Elongated Man, and Detective Chimp, as well as Infantino’s controversial era as DC Comics’ editorial director, and his subsequent return to drawing comics in the 1970s, ’80s, and beyond. An introduction by comics legend Roy Thomas rounds out this comprehensive look at one of comics’ foremost creators. 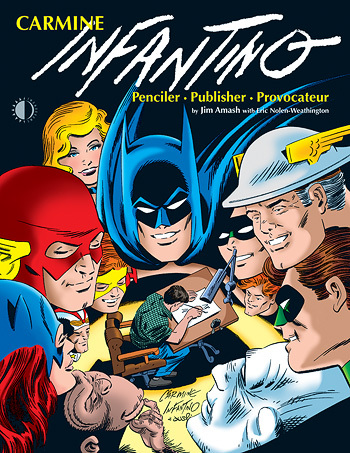 Don’t confuse this with another Carmine Infantino book that came out a decade ago. While a fine book in its own right, that one only touched the surface of Carmine’s career. Jim Amash has done months of extensive interviews with Mr. Infantino to make this book the most comprehensive coverage ever done on his storied career. There’s plenty of in-depth information in this book that you’ll not find anywhere else. This entry was posted in TNT on 7 September 2010 by Mr. Morrow.